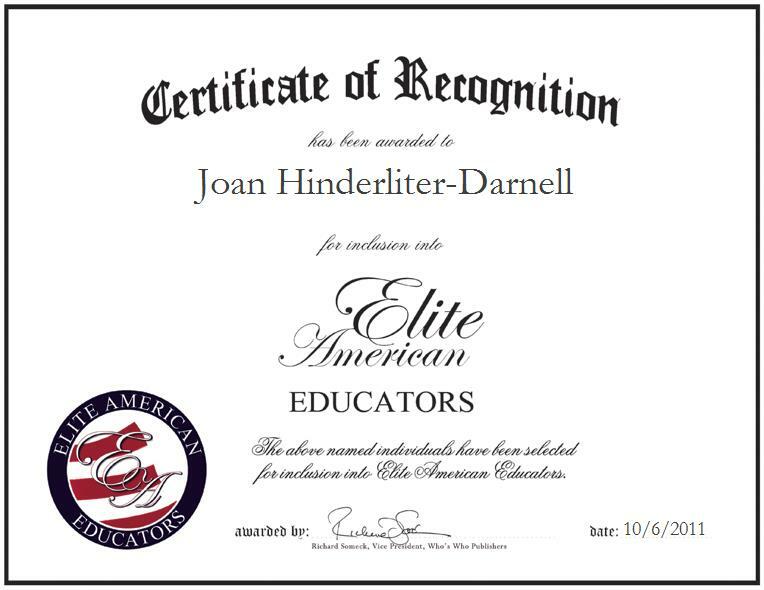 CAMDEN, NJ, October 6, 2011, Joan Hinderliter-Darnell, Inclusion Teacher for the U.S. Wiggins College Preparatory Lab School at Camden City Public Schools, has been recognized by Elite American Educators for dedication, achievements and leadership in special education. Ms. Hinderliter-Darnell, who has spent nearly three decades in the field of education, has had many success stories with students who have experienced trouble learning throughout their youth, and blossomed into achievers in their adulthood. Her enthusiasm for helping children with special needs to accomplish their goals to learn and grow has become relevant throughout the 12 years spent with Camden Public Schools, as she currently strives to teach children the basics with goals set by U.S. Wiggins College Preparatory Lab School. She works with children in special programs, teaches mathematics, writes reports, and customizes instruction based on each child’s special needs. With a versatile background in education, mathematics, organization and art, Ms. Hinderliter-Darnell lends her expertise to the school in order to provide the education that students with special needs deserve to achieve success. As a kindergarten inclusion teacher, Ms. Hinderliter-Darnell feels that every day is an adventure, never knowing what the students will say or do. She and her co-teacher are always on their toes. Inspired by the experience she gained by working with special needs for the Girl Scouts of the USA, she followed her current career path and has since remained diligent in her goals to ensure that these children with unique educational needs are able to overcome challenges and receive quality schooling. For her demonstration of vocational excellence, Ms. Hindeliter-Darnell was named a Cambridge Who’s Who Professional of the Year in Special Education. She has also been recognized by her professional peers as a giving, caring, individual, who is sensitive to all the needs of her students and genuinely wants each and every child to be successful. She believes that communities should be more supportive of the educational needs of children, as unfortunately some are not compassionate and accommodating to the diversities of individuals with special needs. Ms. Hinderliter-Darnell has amassed a wealth of experience throughout a career that has spanned more than 28 years. She earned a bachelor’s degree in elementary and special education from Kutztown State College, and she received a master’s degree in growth and development from LaSalle University. She has also remained abreast of trends and developments in education as a member of the School Spirit Committee, and she supports a number of worthy causes including Collecting Can Tabs and the Ronald McDonald House Charities. She looks forward to contributing to the continued growth and advancement of the special education field in the years to come.